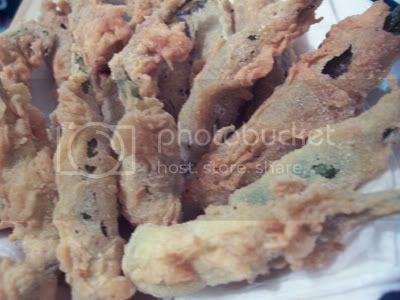 This week’s theme for Lasang Pinoy Sunday is FRIED and it just so happened that I was frying up some fried chicken last week and decided to fry up some okra from the garden too. 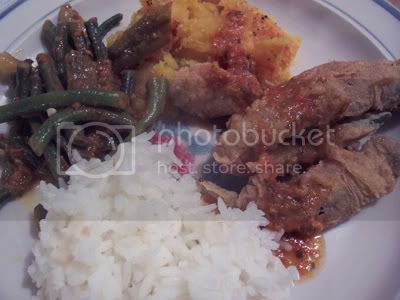 I usually make a stew with okra but then I end up eating it by myself. When I fry it up like this though, everyone diggs in and dips it into their favorite sauce. Combine all the dry ingredients: cornmeal, flour, salt, garlic powder and black pepper in a bow. and in a separate bowl, scramble the eggs. Heat oil in a frying pan. Dip okra in the beaten egg then roll in the flour mixture. Fry in the medium hot oil until golden and drain on paper towels. You can eat fried okra as is or you can dip them in: ranch dressing, tomato sauce, salsa, or as in the case of my vegetarian dinner (see photo below), drizzled with spicy sofrito sauce. Recipe for the beans in spicy sauce coming soon. Click here to see other LaPiS entries for Fried. Hi, JMom. I’m a major okra fan, too! (In pinakbet, simply steamed and served with bagoong, in gumbo…) I’ll be trying out your tempura/fritter-style version soon. this is by far the healthiest fried entry this week! thanks for the recipe…will try this soon! okra from your garden! i so envy you! :) have a great week J!